The calm pool area is a great place to play and cool down. Scenic ponds and gardens mix with Hawk's Landing Golf Course. Spacious rentals with large living and dining areas are perfect for families. Gather round for songs and conversation by the fire pit. Pick mint and basil at the resort's own garden. Eat lunch out on your own personal veranda, overlooking the resort's expansive grounds. Bubble baths just got even more relaxing. Every condo has a tub with jets. 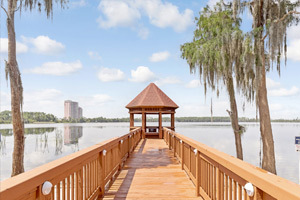 The largest of Marriott’s Palms resorts, Marriott’s Royal Palms is at the heart of the Orlando action, near the area’s best theme parks and attractions. The property is laid out as sprawling townhouse rentals shaded by trees and next to Hawk’s Landing Golf Course. You don’t have to go far for your morning coffee; the on-site marketplace serves Starbucks! The outdoor pool has a basketball hoop. Go for a swim, or challenge the kids to see who has the best shot. When it’s time for lunch look no further than the bbq grills and the covered picnic area. The little ones will love the playground. The well-equipped fitness center has everything that you need to get your cardio on or head to the tennis and basketball courts. The resort is adjacent to the Orlando World Center Marriott; you’ll have access to several great restaurants and a huge pool complex. Air-conditioned two bedroom condos sleep six guests and offer everything you need for a comfortable and relaxing vacation. Make family favorites in your full kitchen. Bake up a batch of your famous double-chocolate brownies and let the kids help out. You’ll be thankful for the in-suite washer/dryer when the kids end up covered in chocolate. Flat screen TV with premium cable and DVD players are perfect for watching your favorite show, or for family movie night. Bring favorite movies from home, grab the brownies, and call everyone into the living room. First kid on the couch picks the movie. At the end of the night, unwind with a relaxing soak in the in-suite jetted tub. Disney Springs features a variety of shopping and dining options. Surprise your little princess with a makeover at the Bibbidi Bobbidi Boutique. Check out the selection of jewelry at Alex and Ani and Pandora. Pick up a few bath bombs at Basin to use back in your condo. World of Disney® features everything from stuffed animals, Mickey Ear Hats, toys, and apparel. Treat yourself to a new handbag from Kate Spade or Coach. Hungry? Dine at Bongo’s Cuban Cafe, Earl of Sandwich, Rainforest Cafe or House of Blues. For dessert, there’s Ghirardelli Ice Cream & Chocolate Shop or Sprinkles Cupcakes. SeaWorld® is home to Orlando’s tallest, fastest, and longest rollercoaster: Mako. Antarctica: Empire of the Penguin is a motion-based simulator ride that allows you to experience the South Pole through the eyes of a penguin. There are two versions of the ride offered: mild is great for little ones, or those who are prone to motion sickness, and wild is for grownups or brave big kids. See animal shows including dolphins, sea lions, and orca whales. Magic Kingdom® at Walt Disney World® features the most well-known and classic attractions such as Peter Pan’s Flight, Pirates of the Caribbean, Dumbo the Flying Elephant, and The Haunted Mansion.